The past few weeks have brought extremely bad news from Ukraine. The country now finds itself at a crossroads, where fundamental and disturbing questions must be asked about its governability. Domestic elites persist in placing their own personal interests above those of the nation, and Western governments are realizing that their ambition to steer Ukraine by remote control has reached the end of the road. The lifeline that keeps the country afloat is a $17.5 billion Extended Fund Facility (EFF) agreed with the International Monetary Fund in March 2015. How much longer the IMF will be able to maintain this critical life support is a crucial question. If and when it decides to pull the plug, other lenders and investors will run for cover, making a sovereign default unavoidable. The political implications of financial failure would be severe. At worst, the looming threat of Ukraine degenerating into a “failed state” would be realized. Kiev’s implementation of the reforms agreed as a condition for the EFF has been slow and uneven, prompting IMF Managing Director Christine Lagarde to issue repeated stark warnings. Delivery of both the third (September 2015) and fourth (December 2015) tranches of the EFF had already been postponed before the February political crisis erupted, causing even further delays. The trigger was the resignation, on February 3, of Economy Minister Aivaras Abromavicius. After struggling hard for reforms, he confessed to being overwhelmed in the end by government corruption. Mr. Abromavicius’s departure produced shockwaves, prompting President Petro Poroshenko to seek the resignation of his deeply unpopular Prime Minister Arseniy Yatsenyuk. But that plan was defeated by last-minute pressure from the West not to allow the government to collapse. On February 16, Mr. Yatsenyuk just barely survived a vote of no confidence in Ukraine’s parliament, the Verkhovna Rada. Five days later, right-wing nationalists descended on central Kiev, clashing with riot police and burning tires outside the presidential building. March passed in relative calm. But on April 3, it was revealed that President Poroshenko, elected in May 2014 on a mandate to “wipe the country clean of corruption,” had been implicated in the Panama Papers scandals. Mr. Poroshenko had promised that upon taking office he would sell his confectionary empire Roshen. Instead of honoring that promise, it was revealed that he had set up an offshore holding company in the British Virgin Islands. On April 10, Mr. Yatsenyuk tendered his resignation, and on April 14 the formation of a new government was announced. The new prime minister is Volodymyr Groysman, a former speaker of the Rada and a staunch Poroshenko loyalist. The question that is now placed before both the IMF and the EU is whether the new tandem will be able to deliver on hopes and promises that over the past couple of years have been consistently frustrated and broken. It is possible to conceive a modestly positive scenario. A new government always has some leeway of confidence. The appointment of Polish economist Leszek Balcerowicz as special advisor may inspire some faith in markets. Mr. Balcerowicz won international acclaim for his role in charting a successful course of reforms for Poland in the 1990s. He knows both Russia and Ukraine well and can be relied upon to provide sound advice. But given the magnitude of the country’s problems, even in the best of possible worlds, the outlook cannot be better than “muddling down” – a slow erosion of state capacity, economic performance and living standards. The new government’s main challenge is lack of credibility. Markets had hoped, against odds, that Finance Minister Natalie Jaresko would be elevated to the premiership. She had served as the anchor in dealings with the IMF, and had conducted hard-nosed negotiations with the country’s creditors. Appointing her to succeed Mr. Yatsenyuk would have sent a strong signal that the fight against corruption would be joined in earnest. But it was not to be. The defeat of Ms. Jaresko, conspicuously absent from the Groysman cabinet, was also a rebuff to Western governments’ ambitions to decide who does what in Kiev. Their insistence throughout had been that independent professionals – usually meaning foreigners and investment bankers – must play a leading role. This seemed to work for a time. Mr. Abromavicius and Ms. Jaresko – the former a Lithuanian-born asset manager, the latter a U.S.-born venture capitalist – are outstanding examples of the type. Perhaps the most flamboyant was former Georgian President Mikheil Saakashvili, who was surprisingly appointed the regional governor of Odessa, and for a time was also rumored to be destined for the premiership. President Poroshenko not only tried to be accommodating by offering speedy Ukrainian citizenship to a procession of foreign experts. He could also be mindful of outside “advice” concerning appointments. Having witnessed how the last-minute application of outside pressure saved Mr. Yatsenyuk from being voted out of office, in late March Mr. Poroshenko traveled to Washington to seek – and win – approval for a new government to be installed. The fall of Mr. Yatsenyuk was a symbolically important setback for Western ambitions to micromanage Ukrainian government affairs. His original appointment, in the wake of the February 2014 “revolution of dignity,” was the result of heavy U.S. pressure. Never popular from the outset, by the time of his ouster Mr. Yatsenyuk’s credibility was in shreds. According to a March 2014 poll, 44 percent of Ukrainian voters strongly or somewhat disapproved of his work. By February 2016, that number was 89 percent. Washington had backed a losing horse. The present government has been purged of all foreign and technocratic influence. Even the former Georgian-born health minister Alexander Kvitashvili has been dropped. The reasons are not encouraging. In the words of Ukrainian lawmaker Mustafa Naem, “they were pushed out for not wanting to play by the old rules.” The single exception is Finance Minister Oleksandr Danylyuk, formerly with McKinsey. Will the IMF be able to continue its crucial life support? The answer hinges critically on whether the new government will be able to deliver. The tasks ahead are daunting. Beyond cleaning out corruption, Mr. Groysman’s team needs to get serious on constitutional reform, notably on the separation of powers and decentralization. The former requirement clashes with President Poroshenko’s profound inclination toward secret dealings and reliance on loyalists. The latter imperative is hostage to fears of yielding to Russian demands for federalization. Securing a constitutional majority for anything that smacks of special status for the separatist-held areas in the Donbas seems politically impossible. This legislative standoff is particularly ominous. Absent a Ukrainian readiness to make good on its commitments to the Minsk agreement, it will be hard for the West to increase pressure on the Russian side. The present situation has all the signs of a true impasse. Although Kiev committed from day one to dialogue with the separatists, this has still not happened. Beyond a reluctance to give legitimacy to “terrorists,” the government believes that entering into such negotiations would lend support to Russia’s argument that the crisis is an internal Ukrainian affair. Meanwhile, it remains a fact that in the final analysis, it is up to the Kremlin to decide whether Ukraine stands a serious chance of recovery. And there is still plenty Russia can do to frustrate whatever plans the West might devise. At the time of Russia’s surprise intervention in Syria, there was a general expectation that this could be a game changer, opening the doors for a deal on Ukraine between Russia and the West. But while there has been much backroom haggling, little progress has been made. In disturbing contrast, Germany’s Bild Zeitung revealed that the Kremlin has set up what amounts to a shadow government for the separatist-held parts of the Donbas. Officially known as the “Inter-ministerial Commission for the Provision of Humanitarian Aid for the Affected Southeast Areas in the Regions of Donetsk and Luhansk,” it is staffed by senior Russian officials like Deputy Prime Minister Dmitry Kozak and Deputy Minister of Economic Development Sergei Nazarov. The commission, allegedly, meets regularly under the supervision by the FSB security service and includes no representatives of the separatist “governments.” This all smacks of a longer-term plan to run the Donbas as a puppet state within Ukraine. It is also disturbing that by all indications the war is heating up, suggesting Russia intends to keep Ukraine in a state of instability and insecurity that is deeply harmful to the economy. Looking forward, the fiction of Minsk may be kept alive for some time yet. It is significant that during a meeting with Russian President Vladimir Putin in early April, Austrian President Heinz Fischer suggested a gradual lifting of sanctions in return for Russia’s commitment to a step-by-step implementation of the peace process. The Kremlin also has made gestures of goodwill, such as offering Ukraine a respite on a $3 billion bond default lawsuit and continuing to negotiate on the possible release of Ukrainian helicopter pilot Nadiya Savchenko, who was recently sentenced to 22 years in prison. But none of this comes close to a serious deal. Key to repairing relations between Russia and the West is whether the Kremlin can accept handing back control of the border to the Ukrainian side. Such a move would mean the end for the separatists. Local elections could be held and a semblance of normality restored. 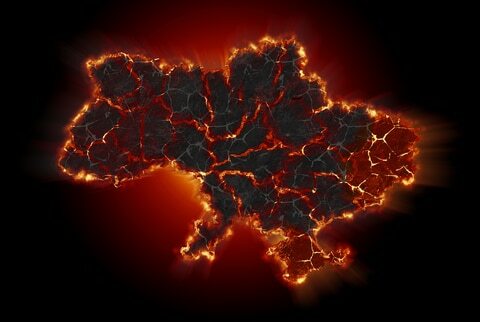 But it is very hard to see the Kremlin yielding without getting something important in return, such as federalization – which is impossible for Kiev to swallow. By far the most troubling conclusion to be reached is that the crisis in Ukraine is mostly homegrown. Russian aggression has certainly caused much damage, and Western indecision has added its fair share, but the main reason why the country remains so vulnerable can be found in the deeply ingrained pattern of oligarchs feathering their own nests. President Poroshenko himself is a powerful symptom of this disease. Since he took office, Forbes Ukraine reports that the president’s personal fortune has increased by $100 million, to $858 million. This at a time when Ukraine was sliding into the abyss and his own chocolate company, Roshen, saw its revenue drop by one-quarter. After winning the presidency with 53 percent of the vote, Mr. Poroshenko’s approval rating is now well below 20 percent. And he will no longer have the unpopular Mr. Yatsenyuk to hide behind. The president is not the only one suffering in the polls. A recent voter survey shows that if Ukraine were to hold elections today, no party would crack 10 percent, while 27 percent of respondents would not bother to vote at all. Hoping that new elections would return a parliament capable of pushing through painful reforms seems very much like a pipe dream. None of the above means that disaster is imminent. The economy’s downward slide has slowed and stabilized. There are surprisingly few signs of social unrest, making it hard for the IMF to simply abrogate its credit arrangement until the EFF expires. This suggests a slow but relentless decline is more likely than a sudden crash. But every week that passes with no sign that the country’s leadership is ready to put the nation’s interests above its own chips away at popular support and stokes “Ukraine fatigue” in the West. At some point, it will no longer be possible for the IMF to keep playing make-believe. There is a stark message here for the Poroshenko-Groysman tandem: clean up your act or be left to fight Russia alone. The second scenario is precisely what the Kremlin has been gunning for all along – to demonstrate that Ukraine is not viable on its own. Disturbing as it may seem, Mr. Putin appears to be playing a winning hand.